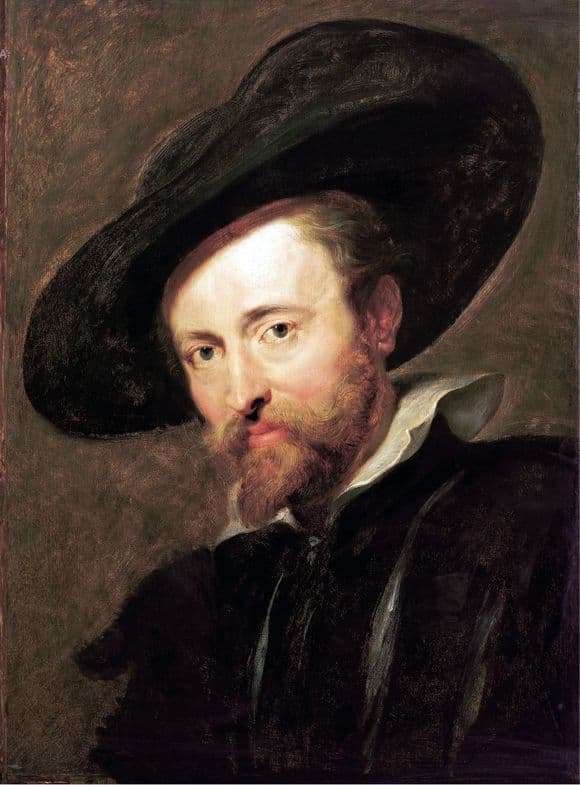 The great Flemish artist Peter Paul Rubens painted many paintings in which he used his own self-portrait. Before him, so many of his images did not do any artist. Unlike the portraits of other people written by him, made in the so-called baroque style – in lush rich clothes with heavy expensive accessories, the self-portraits of Rubens himself look more like everyday images. These portraits evoke associations with photographs taken by any of the household, during ordinary activities. At the same time there is not a single gram of narcissism or protrusion of any existing or imaginary virtues. In the picture we see an old man in a dark black-and-brown blouse with a starched collar and wide-brimmed hat of a similar shade to a dress. The white collar stain marks off the red of his beard. The hat is devoid of any decorations such as feathers and embroidery. The background of the painting, like the clothes of a man, is distinguished by simplicity and muted colors. The blond hair of a man is practically hidden under his headdress, his face is framed by a graceful small beard, the pomp of a mustache is tamed by a hairdresser. The high forehead of the thinker, the elongated nose of a noble form, the blush of a healthy person on the cheeks. A man looks at the viewer with clear dark brown eyes, which read the mind, education and vigor. All this is not a mere allegation, since Rubens was a very ambiguous personality. He was interested in natural sciences and philosophy, corresponded with many scientists people of that time, and also was engaged in diplomatic activity. Drawing portraits of kings and nobles of different countries, Rubens led secret and not very negotiations, and was involved in politics. He was the unofficial confidant of Infanta Isabella. And with all this, he managed to write – and wrote about 1,000 paintings.